My childhood friend CC and with SL came over for a visit last week. I seriously welcome them especially when I was literally bored to death lying down all day long. SL shared with me her back pain experience and was telling me this sinseh that knows how to help me shift back the disc. Though accupuncture helped me tremendously, at least to remove the acute pain but somehow, I know deep inside, it is still not healing well. When JC came to know about my health problem via Facebook, she messaged me about this sinseh that she knows might help me. Just imagine two persons sharing the same information on the same day! I think God is really watching out for me by sending me angels to deliver the good news. On Monday, CC was really sweet, she actually went early to the clinic to queue so that I don't have to wait long. Aren't you jealous that I have such great friend? Yes this is the same girl that actually fetched me down for an interview many donkey years ago when I was too ill to travel down for an interview that I cannot missed. Can't recall the in between story but if I am not wrong, I did get the job! Just before hubby left town, I made another round batch of pancakes. 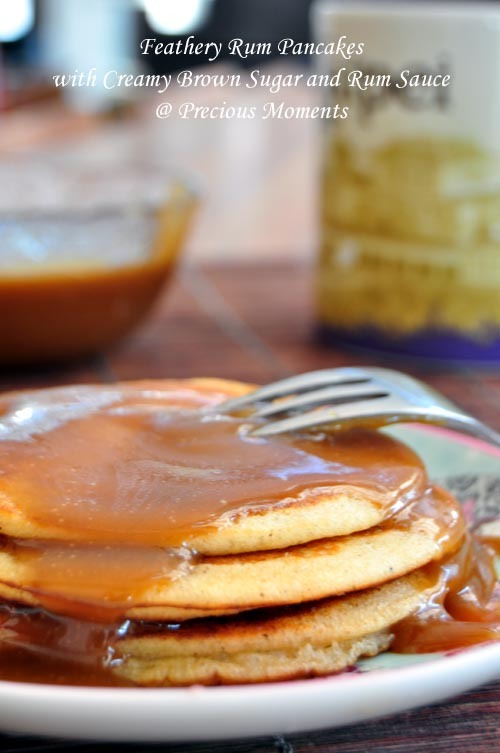 This time, it is Feathery Rum Pancake with Creamy Brown Sugar and Rum sauce. The fragrant while cooking the pancakes and while making the sauce is really awesome. My son initially wasn't keen on it was literally lapping up the sauce. My girl who smelt the aroma couldn't wait to dig in before she heads off for her Sunday school. You be the judge and let me know whether you felt the same way too. These pancakes look absolutely awesome!! 饱满人生, it is true. I am blessed with good friends. Your sauce is so tempting! My, the rum is making me drool already! Your pancakes looks very yummy, I don't mind having a couple of pieces myself! Take care, Edith, it's good to have caring friends! Hi, can you share the contact details of this sinseh please? I sprain my neck over the weekend.